Flowering maples are a group of tender perennials with colorful, bell-shaped flowers. Flowering maples are a group of tender, evergreen perennials often used as seasonal annuals or houseplants in the Midwest. Sometimes also collectively referred to as Chinese bellflower or Chinese lantern – or just abutilon, flowering maples were popular during the Victorian era, later fell out of favor in the gardening world, but have returned to modern gardens in a plethora of forms. The leaves are palmate, varying in number and depth of the lobes. 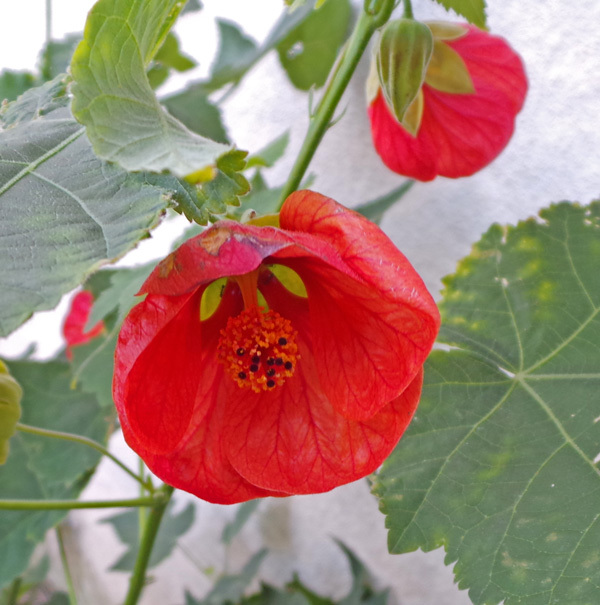 The genus Abutilon is a large group of flowering plants in the mallow family (Malvaceae) with over 200 species occurring throughout the tropics and subtropics. They range in height from 18 inches to 10 feet, and may be herbaceous perennials, shrubs, or small trees. The plants used as ornamentals are often A. x hybridum, a group of hybrids between A. darwinii and A. striatum, or cultivars of other species, such as A. megapotamicum and A. pictum. These plants get part of their common name from the resemblance of the foliage to maple leaves. The plants are unrelated to maples (Acer spp.) but do have palmate leaves often with deep, pointed lobes and/or serrated edges. 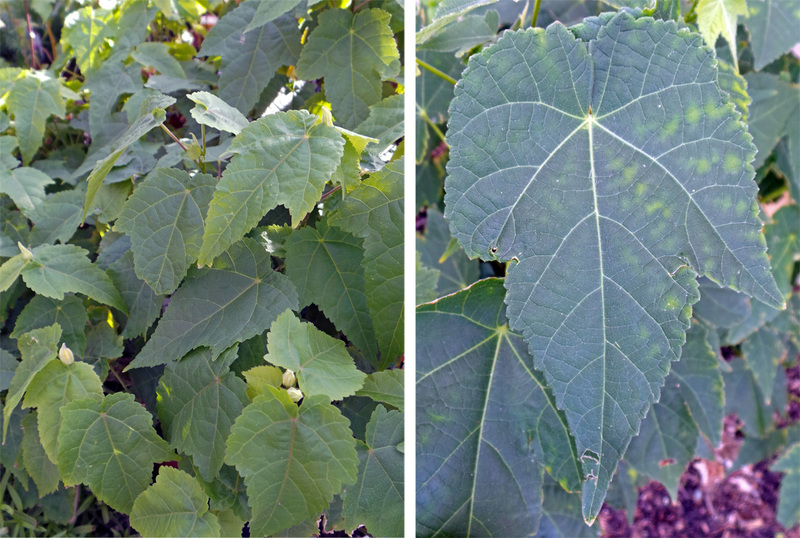 The leaves may cause mild dermatitis in susceptible individuals. 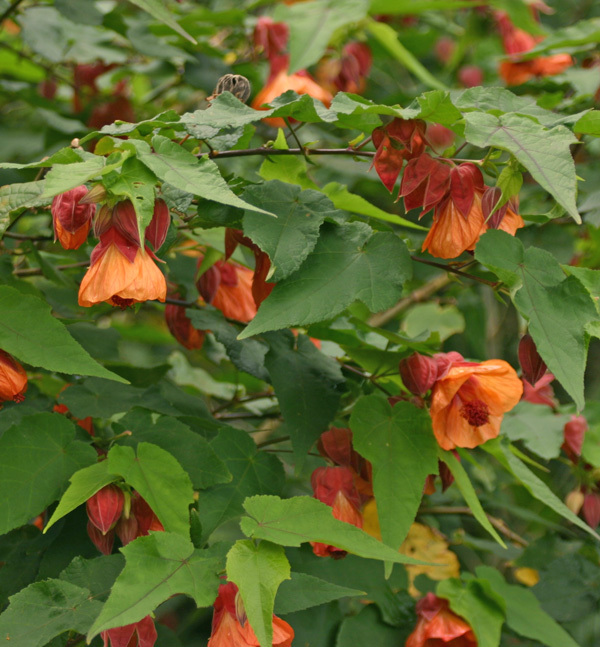 Abutilons are small shrubs, often grown as annuals in cool climates. They are upright, branching plants—often with brittle stems—and some varieties have a structure reminiscent of a Japanese maple. They are low growing woody subshrubs that acts as herbaceous perennials in colder climates, supposedly hardy only in zones 9-11, but will survive in some colder areas as long as the plants have excellent soil drainage. The generally solitary, pendent flowers are borne on long pedicels from leaf axils or near the branch tips on the current season’s growth. The lantern-like buds open to cup- or bell-shaped flowers up to 3 inches in diameter. Solitary, pendent flowers are borne in the leaf axils and branch tips. All have a calyx and corolla with 5 parts, with overlapping papery petals fused at the base, opening to various degrees from trumpet shaped to nearly flat. The flowers have staminal columns typical of the mallow family, with multiple stamens fused into a column lined with anthers, and a branched style with head-like stigmas inside the tube (very similar to that of its relative the hibiscus). The species generally have yellow or orange flowers, but others have red or pink petals with a darker center. The lantern-like buds (L) open (C), to reveal a central staminal column typical of the mallow family (R). Many are attractive to butterflies and hummingbirds. Hybrids rarely set fruit, but the species produce hemispherical pods (schizocarps) with multiple segments, each containing a few seeds. Flowering maples can bloom year-round. The species tend to bloom most prolifically in summer and fall, but modern hybrids have been developed to bloom nearly year-round. Flower color has been expanded by breeders as well, with flower colors ranging from white to reds, yellow, orange, coral and bicolors. Abultilons can be grown in containers on patios and decks. Flowering maples are a great addition to annual or mixed beds or borders, The can be used alone or with other plants in containers, such as patio pots or window boxes. They work well in hanging baskets, where it is easier to see the downward facing flowers. Flowering maple can be grown as a multi-stemmed shrub or pruned as a standard for a more tree-like effect, and many types can even be used for espalier. The variegated forms may be grown more as foliage plants than for their flowers. 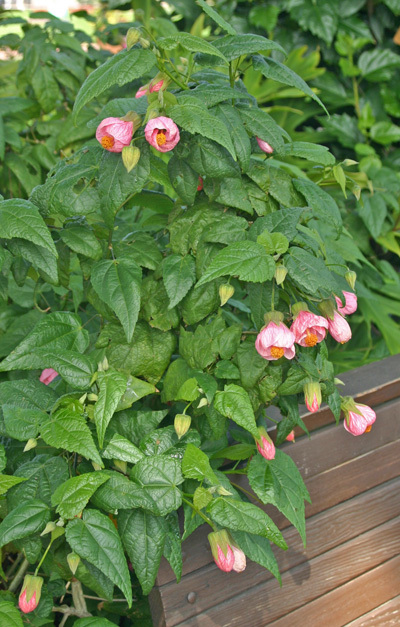 Grow flowering maple in full sun or partial shade. They grow in almost any type of soil as long as it is well-drained and evenly moist, doing best in rich soils. Plants will struggle if allowed to dry out too much. They typically do not have any significant insect or disease problems outdoors, but indoor plants are susceptible to the most common insect pests including aphids, mealybugs, scales and whiteflies, as well as spider mites. Regular pruning will keep flowering maples compact and promote blooming. Flowering maples are easy to grow in containers and overwinter indoors. If given sufficient light, many will continue to bloom through the winter. They do best in a bright, sunny location, but prefer relatively cool temperatures (60’sF). Containers can be moved outdoors after the last frost, and should be moved back indoors before the first frost in the fall. Keep evenly moist during the growing season, but reduce watering indoors in the winter but avoid letting the plant dry out completely. Fertilize regularly starting in late winter when growth resumes, and stop in the fall. Some people recommend monthly fertilization, while others suggest every other week with half strength solution. Repot in the spring every year or two, using standard soilless potting medium. Moving to a larger pot will allow the plant to grow larger, so if space is limited just repot in the same size container. There are numerous cultivars of flowering maple in many different colors. These plants have a tendency to become leggy and without regular pruning they can grow into a scraggly shrub. To maintain a dense, compact form they need to be pinched regularly. This will also promote more blooms as they only flower on new wood. Pinching, pruning and keeping a plant slightly root bound will help control its size. Major pruning should be done in early spring or late fall. Cut back branches selectively to shape the plant, making the cuts just above a node or on a strong, vigorous shoot near the plant’s base. 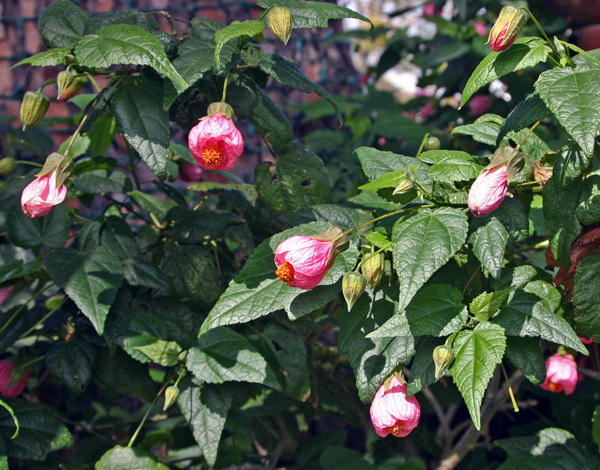 Abutilon species can be grown from seed (it may take a full year before they begin blooming), but cultivars and hybrids are propagated by softwood cuttings taken at any time of the year. Bottom heat will speed rooting. Tip cuttings can be taken in late summer to overwinter instead of keeping the entire plant. ‘Bella’ series – blooms early with large flowers on compact plants (to 15 inches) in shades of apricot to orange, pink and deep red. ‘Canary Bird’ – sports yellow, trumpet-shaped flowers on rounded plants. It was awarded the Royal Horticulture Society’s Award of Garden Merit (RHS AGM) in 1993. ʻKirstenʼs Pink’ – has lots of soft pink flowers on a compact, upright plant (12-16”). A. megapotamicum, from southern Brazil and Uruguay, has small pendent flowers with yellow petals and a large red calyx. It was awarded the RHS AGM in 1993. Abutilon megapotamicum plant (L), narrow leaves (LC), flower bud (RC) and open flower (R). A. × milleri has long, narrow leaves and pale orange flowers with red calyces. It was awarded the RHS AGM in 1993. 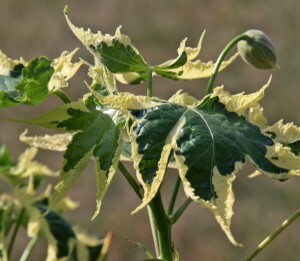 An Abutilon with variegated leaves. A. pictum has toothed leaves with 3, 5, or 7 lobes. The flowers are orange-yellow with dark red veins and protruding stamens. The cultivar ‘Thompsonii’ has yellow mottled leaves. ‘Savitzii’ – has extensive cream marbled variegation on the green leaves, but few flowers with salmon-colored petals. It was awarded the RHS AGM in 1999. ‘Souvenir de Bonnʼ – has leaves with creamy white edges and soft peach-orange flowers, and will grow up to 3 feet tall. It was awarded the RHS AGM in 1993. Looking for new offerings for our greenhouse. Good to know it can be over wintered inside. Hi there! 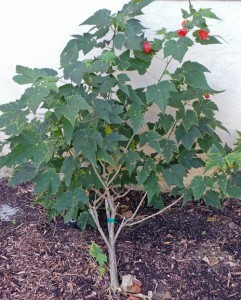 I also live in northern CA (Eureka, to be specific) — I just planted an abutilon megapotamicum hybrid called Lil’ Red. I’m curious how long it takes for these guys to reach full height. We’re in the 9b gardening zone. Any thoughts guys? I live near Monterey, in California. I actually propagated one from a cutting, and got another one for a gift. The propagated one is healthy and blooming. It took just over two years. The other one has a little different flower, more waxy inside and Fuller. It seems really unhappy, and the leaves are turning yellow like it need nitrogen, but I have been feeding it. Any suggestions? I live in Northern California and have six (6) different kinds of these plants. I fell in love with them when I planted my first one two years ago. I forgot to take my plants in last year and we had snow a couple times, but not too much or to deep and I was surprised to see they survived. I’m not sure of all of the varieties but the ones I do know that I have are; Tiger Eye, Fairy Coral Red, Thompsoni, and Lucy Lantern Tangerine. What I like most about these plants is the variety, they each are not only a different color but also grown differently in size and shape. My humming birds love these plants and with them being easy to care for they are a great addiction to any garden. I can’t wait to find a new variety and add it to my collection. I am in Foster City just 20 minutes from San Francisco zone 9b. I have a several varieties of the plants and I have started to weave 3 different colors in one pot. They are just amazing when they are in full blooming. If you are going to try, make sure you match the growth patterns since some are more twiggy and slow growing that others unless that is the effect that you are looking for. I actually sell the 1 gallons all year long so look me up in craigslist if you are interested. These plants does not like full sun where I live. They favor morning or afternoon sun on an area with filtered or reflected light. They need well draining soil and watered every 2 to 3 days and more frequent during hot and windy days. I’m in the foothills in Placer County, California. I have them in 6 inch clay pots at present and both are blooming nicely. One is a pretty yellow, very large, open flower, about 3+ inches across. The other is a nice dark red, more closed bell, under 2 inches across. I wish I knew how tall they were going to be! I also live in Placer County foothills. Mine seem to flower but the leaves are sparse. Do you use fertilizer? If so, could you share. I’m told if there are less leaves and more blooms, the flowers are trying to seed themselves. Love these plants. I’ve got four different varieties. As an experiment I left one out over winter, planted in the ground. It survived. 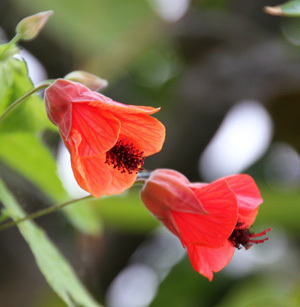 An Abutilon hybrid called ‘Tangerine’I live on an Island in the Puget Sound area. Zone 8b I think. Abutilon are pretty commonly available at most nurseries around here. Hi I’ve had this green maple 4.5 summers. I purchased it when it was approximately a foot in height. This is the first early spring it bloom flowers. I wasn’t aware it bloomed. Funny thing the bloom is only the top half. I found this plant at the end of our selling season. I had no idea what it was never heard of it before. Knowing me I had to buy it…lol. Now I’m loving it so much. I planted it in my garden not knowing what it would do. I live in S.Dakota so I’m going pot it up for the winter. I keep it cool in my apt. But I don’t get a whole lot of light. Any suggestions in keeping it alive would be helpful. I just noticed that date hope it made it! I picked one up at Half Moon Bay Nursery. It’s grown to 6ft tall in a few months. After 40 years I finally found another ‘Souvenir de Bonn’ abutilon, which was shipped as a broken twig, barely rooted, but it survived and grew into a lovely 5′ tall potted tree. The way it looked when I received it is why I prefer to buy plants locally, but nobody had it where I lived in Pennsylvania. I kept it indoors all winter, but it loved summers in our shady yard. I had to set it in a saucer filled with water to protect it from all the ants who loved to feed on the nectar-laden blossoms. The flowers drip nectar in amazing quantities, leaving blobs on the windowsill inside, and attracting ants by the thousands–in the house, and in the garden. I brought it with me when we moved to Guilford county, NC, and it still has to spend winters inside, but the hummingbirds here slurp the nectar from the flowers as soon as they open: the ants are no longer a problem. It has a spot in the front yard, between a mass of rudbeckia and a birdbath. I just added another hummingbird feeder as well. They go crazy darting between the feeder and the soft orange blossoms. The foliage of this variety is so beautiful that I would love it even if it never flowered. In winter, I feed it very little so the flower/nectar issue doesn’t come up. mostly cool nights. We found these at a local nursery that no longer carries them. We are in zone 9b. They required little care, and we had blossoms on each year round. I wish I would have taken cuttings before we sold the home. We had a pink bell-shaped blossoms on one that ended up in a tree shape, and was so pretty. It was about 15 feet tall, and was not a dense tree which made it even more beautiful. We also had a japanese maple tree in the same bed, towards the other end. We had one on the other side of the yard, that ended up being very dense, and shaped like a hedge. It had multiple yellow bell shaped blooms that stayed year round. Right before we moved, we planted a white bell shaped flowering albutilon, but since we sold the house 12 or 13 years ago, we don’t know how it ended up. All of them bloomed all year round, required little care, and we let them grow in the shapes they chose. Unfortunately, the people that bought our house, took out most of our front yard landscaping, and replaced it with rocks. I get so sad when I think of the beautiful roses, and our lilac tree, and several other plants and trees disappeared. We asked the new owners to contact us if they were removing anything as we would transplant to our new home, but they didn’t. The bell-shaped flowering maples were beautiful, and required very little care. Our blooms lasted all year. All of them were full of bell flowers year round. We tried calling the owners, and their phone was disconnected. I was going to ask if we could take cuttings to start them here in our new house we just moved to. I am having a hard time finding actual plants. I did order some seeds, but I would prefer to buy a larger plant from a nursery or online source. So far, I have only seen seeds, and very small plants. I can’t find the ones we had which were open bell shaped. Also, the nursery we bought them from was sold, and the new owners didn’t even know what they were. I was so disappointed. I thought of knocking on the door, to see if they still existed, and if I could get cuttings, but I am scared to even go into the backyard, only to see rocks, and all plants and trees missing. Our backyard was even more beautiful than the front. We would have never left that house, but we were forced to so our children could go to the desired high schoool. We were a block out of the district lines. Anyway, we read that these plants/trees do really well in 9 – 11. They didn’t seem to suffer in the hot temperatures in the day in the summer, and the cold spells we would get in the winter. Sometimes the temperatures would drop in the 30’s, but mostly around 40 degrees. Good luck to all who are pursuing finding this plant/tree. It is well worth the effort. Hi Patty! Monterrey Bay Nursery in Royal Oaks, CA, a wholesale nursery, supplies many nurseries in Southern California (Im in Encinitas) with abutilon plants in a wide variety of colors. Our local retail nurseries will special order for us down here, so check with someone up there that you know and love and see if its an option. Hope this helps! I’m saddened to hear about the changes the new owners made to your former home. The same happened to my home in Texas once I sold it, and it pained me greatly to see the plants I had nurtured vanish. I’m in Idaho now, so having these tender plants outdoors year round is not possible. I sold my home and moved to an apartment a couple years ago. I still live in the same area, so I drive past the house every so often. The front yard landscaping I did is mostly still the same, which makes me extremely happy. I’m not sure how the back yard fared, but the front was my pride and joy. Thank you for your comments regarding Abutilon spp. I recently purchased a very small specimen and I’m looking forward to watching it grow. Patti, Golden Nursery in San Mateo carries them from time to time. When we asked them about a beautiful “tree” in their parking area, they told us they would be a small shipment would be arriving shortly. We’re thrilled with the beautiful 5 gallon plant we got! My flowering maple has leaves that are turning yellow overnight. There is no spottiness or dry edges, just the whole leaf turns yellow. What does it need? Thank you in advance. The comments section really isn’t intended for asking questions. If it’s just the lower leaves, that’s probably natural senescence. Otherwise, contact your local county Extension office for help in figuring out what is going on. I only see a few varieties offered as seed online. I’m particularly interested in A. megapotamicum. Is anyone aware of a seed distributor open to the public offering a variety of abutilons? It’s good to know you can cut them back in the fall. I like the fact that if cared for correctly, this plant can flower year round–and are easy plants to grow in containers. They can enhance attracting butterflies and hummingbirds while they are outside. I also like the paperlike blooms that hang down–and come in multiple colors.